Nordfyns Bank is a Danish local bank located in the Northern part of Funen, holding eight branches in Kerteminde, Odense and Middelfart. The bank is quoted on the NASDAQ OMX Copenhagen stock exchange. The bank – amounting to a market cap of DKK 180 million – is intended primarily for small businesses and private costumers. rotten loans leading to a DKK 500 million write down. Thus, though the Danish bank sector now seems healthy, it still proves a bit moldy in the corners, suggesting investors to do a thorough quality assessment of bank subjects before any commitment. The quality assessment of Nordfyns Bank is partly based on “Tilsynsdiamanten” – a rating system published yearly by Finanstilsynet rating the healthiness of banks along five dimensions – and the generally accepted yearly risk assessment report by Niro Invest. These reports are supplement by thorough examination of the lending portfolio and write down profile of Nordfyns Bank. The risk rating Niro Invest focuses on capital adequacy, industry concentration, depreciation, profitability, business development and earnings. Notably is the large continuous improvement from rank 70 to a solid rank 20 in the period 2008‐2012. This witnesses a capable and responsible management significantly improving the risk profile of Nordfyns Bank relative to other banks. Looking at “Tilsynsdiamanten”, Nordfyns Bank is only assessed within four dimensions; growth in loans, property exposure, funding ratio and coverage of liquidity. As evident from Table 2, Nordfyns Bank meets all requirements with a significant margin. This indicates that Nordfyns Bank is indeed a healthy bank. 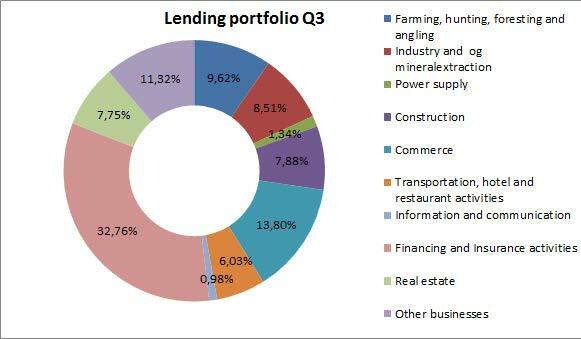 lending portfolio its composition is dominated by financing‐ and insurance companies (32.76%). This is a healthy sign since this line of business generally is in good standing. Further, it can be noted that the costumer group of farming, hunting, foresting and angling, which historically has been stressed and given rise to massive write downs, only holds a limited share of the portfolio (9.62%). The development in the lending portfolio since the 2012 annual report has also been positive. The costumer groups of financing and insurance has along with commerce grown significantly, whereas the weight of the more questionable group of farming, hunting, foresting and angling has diminished. The financial crisis cried out for write downs due to worsened expectations to lendings. Nordfyns Bank has seemingly been taking these necessary write downs immediately upon appearance. Figure 3 draws a downward sloping picture as one would expect. This is notable, especially comparing to the development among two comparable banks; Vestfyns Bank and Lollands Bank. That Nordfyns Bank has been able to inflict themselves these massive write downs immediately upon the financial crisis displays that depositors are confident in Nordfyns Bank not fleeing away. Related to this, when winds howled outside management proved once again responsible and competent not hiding “ghosts in the closets” like similar banks show evidence of. On the basis of the positive reports from Niro Invest and “Finanstilsynet” supplemented with a healthy lending portfolio and a particularly sensible write down profile it is our belief that Nordfyns Bank’s analytical quality is highly solid and fairly better than most immediate peers. The valuation is based on a multiple comparison since we, referring to the introductory discussion of the banking sector, believe that the market generally is too harsh on a very unpopular sector undervaluing the sector as a whole. Further, most stressed small banks must be assumed failed at this point, and since the market typically has a hard time pricing small cap stocks we believe that small cap banks hold huge potential. The multiple comparison is based only on profitable Danish banks with equity of less than DKK 1.0 billion. Looking at the price to book ratio Nordfyns Bank is located around the average. However, with a price to earnings ratio of 6.03 Nordfyns Bank is in fact by far the cheapest bank based on earnings. 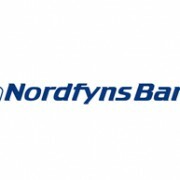 Further, it is noted that Nordfyns Bank had the highest ROI in the period Q3 2012 to Q3 2013 and also have performed better than average in the period Q3 2008 to Q3 2013. Lastly, we notice that the bank has had an impressive average growth rate over the last 10 years, however beaten by Vestjydsk Bank. Based on the multiple comparison we feel confident in pointing out Nordfyns Bank as the best investment subject among Danish banks with equity less than DKK 1.0 billion. the sector as a whole is undervalued, and since the multiple comparison reveals Nordfyns Bank as the strongest investment case among small Danish banks Investment Panel Aarhus recommends the stock.